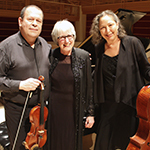 The Navarro Trio, music department Chamber Artists-in-Residence, was co-founded in 1992 by pianist Marilyn Thompson and cellist Jill Rachuy Brindel. With violinist Victor Romasevich, The Navarro Trio has performed virtually the entire “standard” piano trio repertoire. They are advocates of out-of-print and rarely performed works and frequent collaborators with leading Bay Area musicians. Program selections will be announced at a later date.